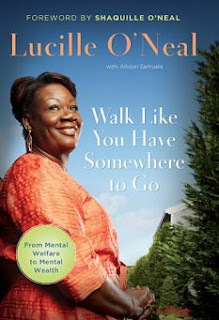 Walk Like You Have Somewhere to Go by Lucille O'Neal is an extraordinary book. From the beginning until the end her life story is hypnotizing. Not because she is so different from other women. It's because she is an ordinary woman who kept God close beside her. In the worst of times and the best of times Lucille O'Neal was like Job. She believed her Redeemer lived. In the Foreward of the book Shaquille O'Neal, the NBA basketball player, calls his mother an angel. Since I did not know anything about Lucille O'Neal before opening the book, my eyes would always glance down to the light green round circle on the front of the book, Walk Like You Have Somewhere to go. The words in the circle are "From Mental Welfare to Mental Health." I had never heard the term Mental Welfare. The two words had my attention until she explained their meaning in the book. What did you learn this week?